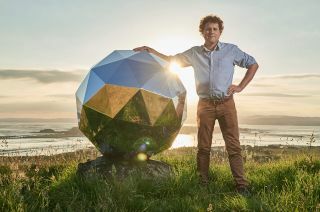 Rocket Lab founder and CEO Peter Beck stands with his creation, "The Humanity Star," which is visible in the night sky if you know when and where to look. If you get up before sunrise this week in North America, you may get a glimpse of what some have come to call the "cosmic disco ball" moving across the predawn sky. The American company Rocket Lab launched the small satellite known as the Humanity Star on Jan. 21 of this year. The satellite is currently orbiting Earth, was built to reflect the sun's light and is meant to be "a bright symbol and reminder to all on Earth about our fragile place in the universe," according to Peter Beck, the founder and chief executive of Rocket Lab. Humanity Star is visible for viewers in North America in the coming week's predawn sky. Here, its path is shown from 5:43 a.m. to 5:46 a.m. EDT on March 17. As most satellites go, Humanity Star is not very large — it's a sphere measuring only about 3 feet (1 meter) in diameter. The satellite is composed of a substance known as carbon fiber. According to the manufacturing company Innovative Composite Engineering, "Carbon fiber is made of thin, strong crystalline filaments of carbon [and] is used to strengthen material. Carbon fiber can be thinner than a strand of human hair and gets its strength when twisted together like yarn." The material is five times stronger than steel and twice as stiff, while remaining lightweight. Humanity Star is orbiting Earth every 92.1 minutes, at an inclination of 82.9 degrees. It's traveling virtually from pole to pole, thus making it observable from all over the globe. It currently travels in an elliptical orbit that takes it as close as 176.1 miles (283.4 kilometers) to Earth (its perigee point) to as far out as 294.5 miles (474 km) away (its apogee point). A satellite as small as this would normally be visible only with binoculars, as its visual magnitude typically would be dimmer than seventh magnitude, which is below the threshold of naked-eye visibility under a dark, clear sky. But Humanity Star's exterior is covered with 65 highly reflective panels, giving it the look of a mirrored disco ball from the 1970s. When sunlight strikes one of the panels, the reflective glint is visible from the ground as a brief flash of light. Depending on the angle of the reflection to the observer, the brightness of a flash could range anywhere from magnitude 3 (about as bright as a star of medium brightness) to magnitude -1 (almost as bright as Sirius, the brightest star — lower magnitudes are brighter). Until recently, Humanity Star had not been visible to observers in North America because it had been passing by during the daytime hours. Now, however, it is making passes in the hours just before sunrise and has been sighted by many observers. If you plan to watch for Humanity Star, you'll need a sighting schedule for your location. There are a few places online where you can get such a schedule. Probably the best is the Heavens Above website at heavens-above.com. When you go to this site, you will be asked to log in. Once you register, all you need to do is indicate your location. Then, you'll have the option of selecting whatever satellite you wish to observe. Humanity Star is currently on the short list of eight orbiting satellites; that list also includes the International Space Station. Using Heavens Above, you can generate a sky map showing Humanity Star's path among the background stars. This is important, because unlike other satellites that look like moving stars, Humanity Star is visible only when it flashes briefly into view. Your best bet is to concentrate on that particular part of the path where the satellite is expected to be and watch for a flash or multiple flashes. That's what makes the sky map produced on the Heavens Above page so valuable. Binoculars can help you follow Humanity Star on its path across the sky. Those who have seen it have reported numerous flashes visible in binoculars, with the brightest ones (seen with the naked eye) at magnitudes ranging from +2 (as bright as Polaris, the North Star) to -1 (almost as bright as Sirius). Brighter flashes should occur when Humanity Star is tracking opposite to the sun (in the eastern sky after sunset or western sky before sunrise). Veteran satellite observer Jim Cook, of Germantown, Maryland, noted the following: "Passes seen on the same side as the sun would be back-lit, so that only the bottom reflective panels would produce reflections, all of which would be shallow-angled, and thus dimmer than more direct reflections produced when Humanity Star is passing through the opposite sky to the sun, where at least some of the panels would be more open-faced." In essence, this satellite is tumbling in its orbit around Earth. Sometimes the reflective panels are favorable, and we get many very bright flashes. Sometimes the mirrors miss us or almost miss us, and we get fewer and/or dimmer flashes. Two other sites also provide tracking information, but they provide only the ground track — that is, what part of the world Humanity Star is passing over — without the path through the stars and constellations that are visible on Heavens Above. One website, thehumanitystar.com by Rocket Lab, also provides a lot of background information as well as answers to frequently asked questions. Another is N2YO, which provides not only real-time tracking but also 10-day predictions for your location. In the upper-right corner of the site, type "Humanity Star" in the search box, and hit the search button. Predawn passes for North America will continue until approximately March 24. The next round of passes will come during the evening hours after sunset, opening up around May 11 and closing around May 20. Sometime in the early fall, according to Rocket Lab, Humanity Star will degrade and burn up on re-entry into Earth's atmosphere. There will be no sequels. Humanity Star has been designed to be a one-time, short-term experience. The intention, according to Beck, is to encourage more people to look up at the night sky, particularly those who may not otherwise be looking. Editor's note: If you captured an amazing astronomy photo and would like to share it with Space.com for a story or gallery, send images and comments to spacephotos@space.com. Joe Rao serves as an instructor and guest lecturer at New York's Hayden Planetarium. He writes about astronomy for Natural History magazine, the Farmer's' Almanac and other publications, and he is also an on-camera meteorologist for Fios1 News in Rye Brook, New York. Follow us @Spacedotcom, Facebook and Google+. Original article on Space.com.